Molecular regulation of vertebrate early endoderm development. Cdx genes, inflammation and the pathogenesis of Barrett's metaplasia. Sonic hedgehog in gastric physiology and neoplastic transformation: friend or foe? Understanding how digestive organs develop, their physiology and structure is important for determining new therapies to combat diseases of the digestive organs. 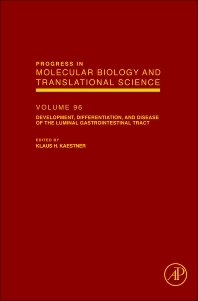 Development, Differentiation, and Disease of the Luminal Gastrointestinal Tract reviews the latest research and developments in this field.